My Daughter saw the trailer for this and she laughed so hard she thought it was so funny. And I am pretty sure you children would love it too. Be on the look out for this movie!!! I know we will. It's time to celebrate Dad! 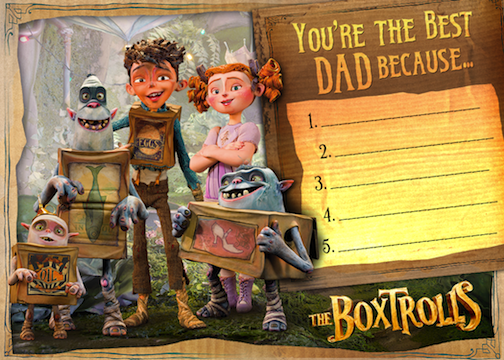 Make Dad's Father's Day special with box-tastic crafts and cards from LAIKA and Focus Features' family-friendly stop-motion animated film THE BOXTROLLS! Check out the cute clip below to see The Boxtrolls' suggestions of fun things to do this Father's Day.